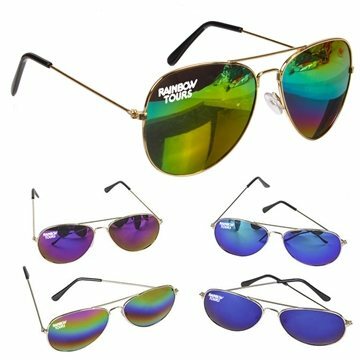 Climb to higher altitudes by adding your company name or logo to these rainbow lenses Aviator sunglasses! Offering UV protection from the sun (UV400), these fashionable accessories feature gold metal frames with imprinting available on the lens. They would make fabulous additions to fundraising gift baskets or party favor bags. With a 70s retro flair, these cool shades are well suited for airline companies, hotels and travel agencies!